Gilded Ashes by Rosamund Hodges. HarpetTeen Impulse, 2014. 111 pages. Ebook. I've read Rosamund Hodge's books Cruel Beauty and Crimson Bound, and although they weren't bad, I wasn't particularly blown away, and I'm sorry to say that I didn't enjoy them all that much. Because of this, I was a little hesitant to delve into Gilded Ashes, but the premise was intriguing, so I decided to give it a shot. 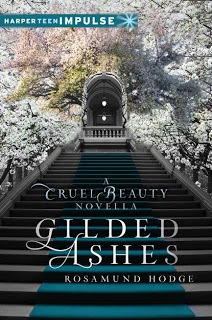 Gilded Ashes is a short, slightly over 100-page novella set in the same world as Cruel Beauty. If you haven't read Cruel Beauty, you can definitely still enjoy Gilded Ashes, but you won't completely know or understand who the Gentle Lord is and why the characters keep making bargains with him, but I promise it's not crucial to understand and should not detract from your enjoyment of this novella. There have been countless Cinderella retellings, so many, in fact, that I get quite tired of them. Gilded Ashes, fortunately, was a wonderfully refreshing take on this plot. In this particular story, Maia is our orphan living with her stepmother and her two stepsisters who try desperately to please their mother. Maia's birth mother, however, made a deal with the Gentle Lord when she died, promising that anyone who hurt her daughter would be severely punished. In brief, this basically means that Maia must continually keep a smile on her face and pretend that everything and everyone in her life is lovely, otherwise her mother will torture or kill the person who harmed her or caused her any pain and grief. Sounds fun, right? It might not be pleasant, but it makes for a captivating story setup. There is also, of course, an upcoming ball where a not-so-happy Duke of Sardis will choose his bride, which completes our plot setup. The story is told from Maia's perspective, and it's eerie. Any task she is given or event she encounters, she must then say how happy she is to do it - no matter the outcome - and its slightly creepy. It's sad. It's haunting. She has trained herself so well and so deeply that this feeling of falseness and actual unhappiness has become ingrained within her. Maia has this amazing awareness of her own flaws and her own lack of importance in this world, and Hodge did a great job making her into such a deep, layered character. I really enjoyed the usage of the two stepsisters element in this retelling, because although they did, of course, have similar stereotypes taken from other Cinderella stories, they were actually rather unique and didn't appear to outright bully or hate Maia, or even really have the desire to. Instead, there was more tension between the daughters and their mother. The sisters desperately want to please their mother, but their mother is still grief-stricken over Maia's father's death, which has subsequently addled her mind. Hodge's world is bleak and hopeless, and the way her characters mesh in with this setting is perfect. Here's what I didn't like: the romance. I know, this is Cinderella, it is romance - but this romance was all too sudden, and this is actually big problem that I've found throughout Hodge's other works as well. Everything happens too fast. The characters move too quickly from strangers to suddenly not able to live without one another. That's generally something I like to call lust, not love. The other big disappointment with this novella was the ending. It just felt like a big rainbow-colored band-aid was slapped on and smoothed over everything so that it did cover up all the damage and tie up some loose ends, but it's still extremely conspicuous and slightly questionable. I'm really glad I had the opportunity to read Gilded Ashes, because it has allowed me to really appreciate Hodge's writing style and ability to create such an in-depth and captivating story in only one hundred pages. Overall, I am giving Gilded Ashes four stars for its wonderful storytelling and compelling characters.